The capital of Russia is hard to imagine without a monument to the greatest poet. It is made of granite. Already it makes such a monument as something eternal, without which you can not imagine the city. This task was set by the creator of the monument: so that it would remain for ever. Pushkin’s head on this monument is tilted slightly forward. He has lively, but at the same time sad eyes. They seem to look at us from the era in which the poet lived. It seems that the sculptor captured the poet, who is in constant creative search. This is evidenced by his wrinkles on his forehead. The poet is constantly thinking about something, and these thoughts do not allow him to distract. 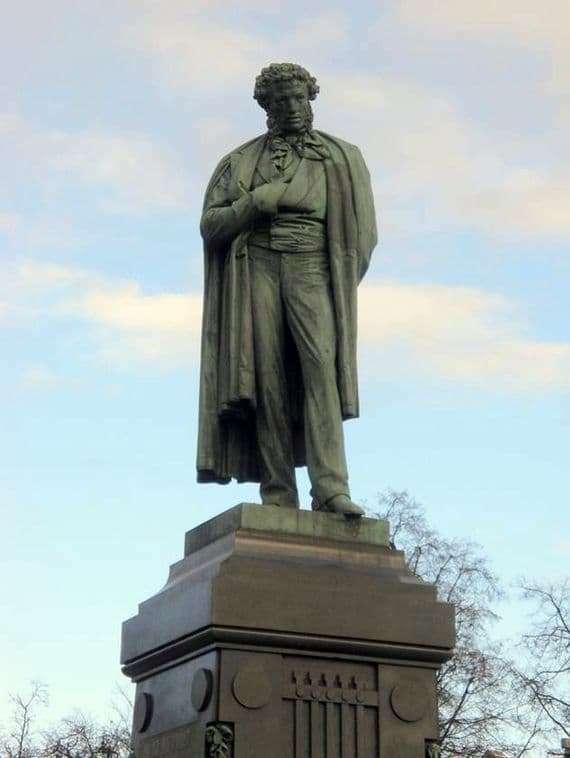 A monument to Pushkin in the capital was erected for his birthday on the square named after him. The monument’s construction year is 1880. In this square, Pushkin looks quite naturally: his right hand is behind the coat, and his left hand is naturally behind him. The monument is constructed in such a way that the observer has the illusion of natural movement. It seems that the poet in the next moment will move and come to us. But, of course, he cannot do this, that’s why he looks at us with a sad look. The monument to Pushkin and the square on which it is located, create a single architectural whole. On both sides of the monument are massive cast-iron lights. They create in the square a unique historical flavor of the last century. I must say that this task was very well succeeded by the sculptor. Around the monument is a chain that looks like bay leaves. It is fixed on the bronze tables. The square itself is surrounded by trees and shrubs. This is done in order to create a special world. We are transferred to it every time we arrive at Pushkin Square to visit the poet.